Journalists in the Maldives face many challenges, dangers, and loss of freedom due to their role or expression of views, the state human rights watchdog has said. The Human Rights Commission of Maldives (HRCM) observed that the Maldives fell four ranks in the Reporters Without Borders’ press freedom index for 2015 to 112th place. “The commission has previously noted that Maldivian journalists face death threats and intimidation and that the Maldivian state has to work to establish an environment where journalists can operate freely,” the commission said in a statement issued today on the occasion of World Press Freedom Day. Journalists should be able to report information on issues of concern “truthfully, sincerely, and without fear”. The commission urged the media to act responsibly and respect basic rights and societal norms in providing information. Journalists should take special care when reporting on issues involving persons with special needs, children, and vulnerable groups, the commission advised. The commission called on all state institutions to ensure a safe environment for reporting and provide information with ease. 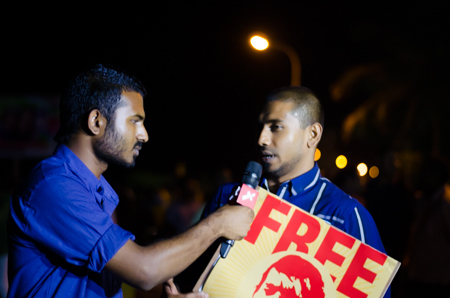 MP Ahmed Mahloof and opposition-aligned private broadcaster Raajje TV journalist Mohamed Wisam and cameraman Adam Zareer are among nine arrested from last night’s opposition protest march. The Criminal Court this morning extended the remand detention of the Galolhu South MP and the two journalists to five days. While one protester was released from police custody, the court extended the remand detention of two protesters to seven days and three protesters to five days. 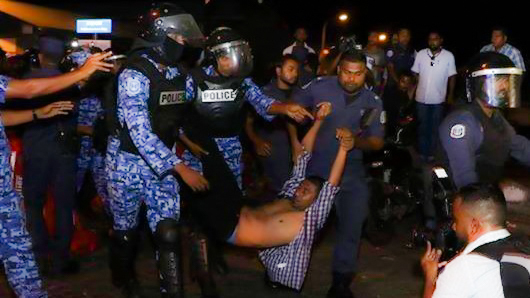 Photos of Specialist Operations (SO) police officers manhandling the Mahloof have been widely circulated on social media. Journalists at the scene reported that the MP’s shirt was ripped open during the arrest near the fish market. The opposition Maldivian Democratic Party (MDP) has meanwhile condemned Mahloof’s arrest, claiming he was “targeted” by the police and due to his outspoken criticism of the government following his expulsion from the Progressive Party of Maldives (PPM). The ruling party’s disciplinary committee expelled Mahloof on February 25 for allegedly defaming President Yameen and bringing the government into disrepute with false statements in the media. In a statement released today, the MDP claimed Mahloof was arrested “brutally” and condemned police for “obstructing the protest in violation of the Constitution”. Police used obscene language while arresting the MP, the statement alleged. The opposition party said riot police officers pepper MDP MP Ali Nizar as well as other protesters in the eye and confiscated the protest’s “sound pickup” and loudspeakers. A Channel One journalist was also arrested the previous night for allegedly obstructing police duties. The Criminal Court extended his remand detention to 10 days. The Maldives Police Service also released a statement alleging that protesters assaulted several police officers last night after breaking through barricades near the Republic Square. Protests are banned in the ‘green zone’ area encompassing the Republic Square as well as police and military headquarters. Protesters also smashed the windows of a police vehicle last night, the statement added. Police officers on the vehicle were attempting to stop protesters from using loudspeakers after 11:00pm. Invoking powers granted by Article 41 of the Freedom of Assembly Act, police issued a statement earlier this week ordering protest organisers not to use loudspeakers or megaphones after 11:00pm and to end the protest at 12:00am. Moreover, police warned protesters against repeatedly gathering in one location or street. The Maldives Police Services has rejected a complaint filed by three journalists alleging the Criminal Court had abducted them inside the Justice Building on Friday night (March 13). The journalists from CNM, state broadcaster Television Maldives (TVM) and Avas said court clerks refused repeated requests to let them out of the building to inform their readers of the outcome of a 9:15pm hearing in former President Mohamed Nasheed’s terrorism trial. All trial observers and journalists were held for nearly two hours inside the building after the initial hearing, as judges deliberated on a verdict. They were not allowed to use their phones or communicate with the reporters gathered outside. Journalists and observers had not previously been informed a verdict would be delivered on the same night. When Mohamed Afsal, Misbah Abbas and Muizz Ibrahim reiterated requests to be allowed to leave the courthouse, court officials refused to allow them outside or inside the courtroom for the verdict later. The three were held in the waiting area until the verdict was delivered. The journalists accused the Criminal Court of kidnapping and terrorism. However, police dismissed the case stating they do not have the jurisdiction to investigate the case, and recommended the complaint be filed at the Judicial Services Commission instead. The Criminal Court had previously barred opposition aligned Rajje TV journalists from attending court proceedings, claiming a journalist from the private broadcaster had threatened Judge Abdul Bari Yoosuf, one of the three judges who presided over Nasheed’s trial. The station has denied the court’s claims. The EU delegation in Colombo and EU member states have noted concern at “mounting gang violence and signs of increasing religious intolerance” in the Maldives. “The EU Heads of Mission, the Ambassador of Norway and the Charge d’Affaires a.i. of Switzerland are very concerned about the recent reports of attacks, intimidation and death threats faced by journalists, politicians, human rights campaigners and representatives of civil,” read a statement released today. The offices of Minivan News were attacked last week, as were those of the Maldivian Democratic Party, and the homes of a number of MPs. Journalists have continued to receive death threats, warning against reporting on such activities. It was also suggested that the ongoing legal action initiated by the Supreme Court against the Human Rights Commission of Maldives “risks undermining the independence of the HRCM, a key democratic institution”. The Supreme Court’s suo moto case relates to the publication of a report submitted to the UN Human Rights Council earlier this month for its Universal Periodic Review on grounds that the compilation of and the content of the report was against procedures, and contained false information. Canadian Foreign Affairs Minister John Baird yesterday expressed concern at the “deterioration” of the human rights situation in the Maldives while the US and UK have also noted their own concerns this month. The Maldives Media and Marketing and PR Corporation (MMPRC) will host a familiarisation tour for UK journalists between October 10 and 15. “The main objective of this FAM trip coordinated by the Maldives Marketing and PR Corporation in collaboration with McCluskey International (official PR representative Maldives in UK) is to allow journalists from a vast range of media to experience the Maldives tourism product and in line generate positive publicity to the destination,” read an MMPRC press release. The corporation also announced earlier this month that it was launching a global advertising campaign with the BBC, running throughout September and October, which would target regional markets in Europe, Asia Pacific, South Asia, Middle East, America and North Africa. Next month, UK journalists from four five magazines will be hosted in Four Seasons KudaHuraa, Anantarah Kihavah, and Traders Hotel in Malé. Visitors from the UK to the Maldives currently account for 7.4 percent of market share, making it the third largest source market behind China and Germany. During the visit of Chinese President Xi Jinpeng earlier this week, President Abdulla Yameen said that he hoped to increase Chinese tourists – who already make up 30 percent of all arrivals – three fold over the next four years. Journalists play an important role in consolidating democracy in the Maldives, said Parliament Speaker MP Abdulla Shahid. Shahid made the remarks while speaking at the official inauguration of Channel News Maldives (CNM) held last night (June 3) at Trader’s Hotel in Male’. CNM Chairman Mohamed Ali Janah, senior dignitaries of the state, reporters from various media outlets, as well as members of the Maldives Media Council and Maldives Broadcasting Corporation also attended the launch ceremony. CNM was registered as a newspaper on 3 May 2011 at the former Department of Information. “The saddest thing that can happen is for the legislative body to try to tie down the journalists,” said Shahid. Shahid emphasised that the country needs journalism that adheres to proper ethical standards and conduct. He also stated that journalists must remember they have to present themselves to the public daily and the public will not accept false information. Former Legal Reform Minister MP Mohamed Nasheed has recommended Maldives-based journalists introduce “peace reporting” in order to stop violence against local media. Nasheed claimed that the Maldives media is exploited by politicians to a great extent and that reporters needed to start looking at the similarities between politicians as opposed to their differences, the Sun Online news agency reported. The Kulhudhuffushi-south MP told local media that a new kind of “peace journalism” should be introduced into the system as the level of rivalry, anger and hatred that exists in the Maldives is too much for people to endure. “One thing journalists can do is introduce peace journalism, promote peace journalism. “Instead of making a big deal out of the differences between two people, and spreading information about those differences in the society – they could present the similarities. We should go for peaceful journalism,” Nasheed was quoted as saying in local media. Nasheed claimed that political leaders prepare quotations in certain ways in order to make the headlines and therefore exploit journalists. “There is a limit even to political influence. There is a limit to how much journalists can be exploited to obtain political advantages. “If all journalists unite and establish certain policies, politicians will have no choice but to follow those policies,” Nasheed told Sun Online.